IC-7200 at Tokyo HamFair 2007. Photo: N. Oba, JA7UDE. Once again, we are honored to present a new Icom HF/6m transceiver in advance of the 2008 Dayton Hamvention. 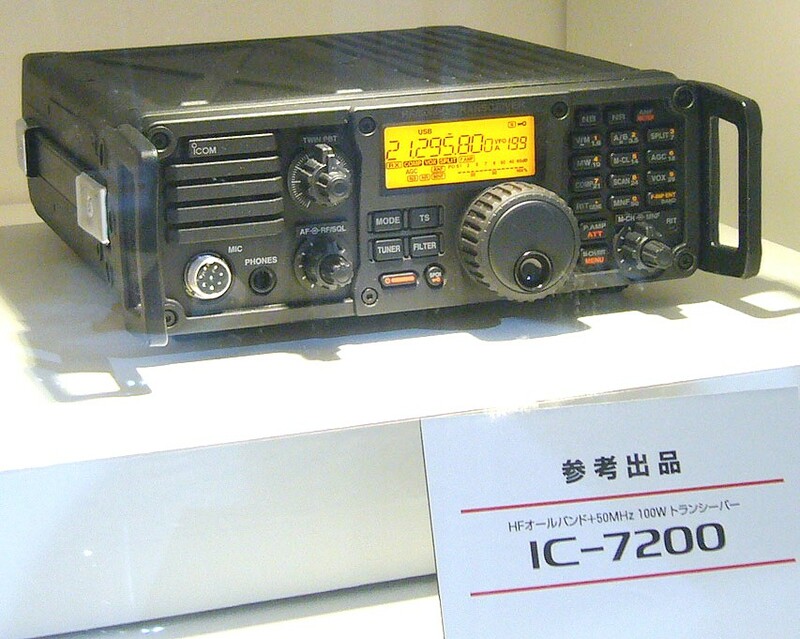 The above photo illustrates the IC-7200 as presented at Tokyo HamFair 2007. The IC-7200 is a compact 100W-class HF/6m HF transceiver, utilizing Icom's well-known and proven IF-DSP architecture and feature set. Note the rugged "manpack" styling. More information will be provided here as it becomes available. IC-7200 display on the Dayton 2008 Icom stand. 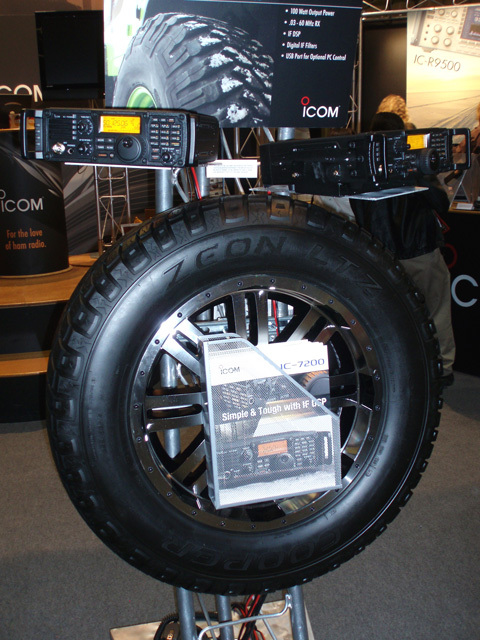 Here are a pair of IC-7200's as displayed on the Icom stand at the 2008 Dayton Hamvention. One of the most striking attributes of the IC-7200 is its construction. This is not an "ordinary" base station radio. It is an outdoor, EMCOMM-capable radio. Features such as the high-stability master oscillator, the gasketing around all the panels, and the 100W power output are perfect for those first responders sending E-Mail via an HF network from a USB-connected laptop. Icom Japan have now announced the IC-7200 on their website, at a domestic MSRP of JPY 104790 (incl. tax). IC-7200 front panel. Photo: Lidio Gentili, IØGEJ. * F1B transmit only; F1B and F2B receive. What, no ATU? It will be noted that the IC-7200 is not equipped with an internal ATU. This makes a lot of sense in an entry-level transceiver; by omitting the internal tuner limited to a 3:1 VSWR range, the radio manufacturer can pack more performance into a smaller, simpler package and allow the user to select an ATU as required. Icom offers an excellent line of accessory autotuners: the IC-AT180, IC-AH3 and IC-AH4. Alternatively, one can leave the tuning aspect to the people specializing in that technology (such as MFJ, LDG and SGC). The configurability and high quality of these "aftermarket" tuners makes them a much more attractive proposition than a limited-capability internal ATU. Generally, no ATU is required when using the IC-7200 as an exciter for a modern solid-state or tube amplifier. Text copyright © 2007-2018 A. Farson VA7OJ/AB4OJ. Image copyright rests with respective authors. All rights reserved.